The 35th Infantry Regiment Association salutes our fallen brother, SP4 George Henry Chace, who died in the service of his country on October 21st, 1966 in Pleiku Province, Vietnam. The cause of death was listed as Small Arms/AW. At the time of his death George was 23 years of age. He was from Pepperell, Massachusetts. George is honored on the Vietnam Veterans Memorial at Panel 11E, Line 93. The decorations earned by SP4 George Henry Chace include: the Combat Infantryman Badge, the Bronze Star with V, the Purple Heart, the National Defense Service Medal, the Vietnam Service Medal, the Vietnam Campaign Medal and the Vietnam Cross of Gallantry with Palm Unit Citation. 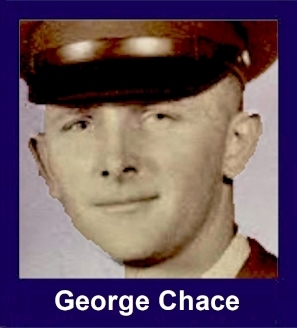 SP4 George Henry Chace, son of Emerson Chace of New York and Mrs. Eva Chace Pineo of East Pepperell, was killed in Vietnam on his 23rd birthday. He was one of 13 children and attended Pepperell schools. War came to Pepperell last week with the shock of a bomb explosion: the first of the town's young men serving in Viet Nam has been killed. Exactly how many others from this community are now active participants in the current conflict we do not know, but the parents of everyone of them will share with George Chace's parents the anguish of his death, knowing that they, too, might some day receive the same sad news. To personal sorrow in such cases will surely be added a feeling of the deepest regret that such sacrifices must be made, wasteful as they are of precious human resources. Yet, this young man has served honorably and bravely. He learned at first hand what the struggle meant to the people of Viet Nam. He thought of the security that his six sisters and five brothers were enjoying in this country; he was willing to sacrifice his life so that more security would be given to the frightened and starving Vietnamese youngsters that he met. This was a high purpose which in the fullness of time may be achieved. By contrast, burning draft-cards or leaving this country for another to escape the call to service seems throughly unbecoming to those who have freely received so much from their country. If the purposes for which men fight have supreme value, the costs of fulfilling them will also be great; but where there is firm belief in those purposes, the effort is never wasted. The life of a young man who walked down Main Street not so long ago has become part of the terrible cost of war. Willingly offered though it may have been, that sacrifice - and those of all the others like him - will not be justified until there is no longer any need for war. Now we who remain must take up the work of those who have left us and carry it on toward completion. fell, mortally wounded, to an enemy bullet. His heroic conduct stopped the enemy for a period of time sufficient to allow the American commander to rally and reposition his forces. Specialist Four Chace's gallant action is in keeping with the highest traditions of the military service and reflect great credit upon himself, his unit, and the United States Army.